NASA astronauts Anne McClain and Christina Koch were set to make history as the first all-female crew to conduct a spacewalk at the International Space Station, but it was announced on March 25, 2019, that the historic spacewalk will be delayed because of spacesuit issues. NASA clarified that it has more than one medium-size spacesuit torso aboard but said to stay on schedule with the space station upgrades, "it's safer and faster to change spacewalker assignments than reconfigure spacesuits." NASA astronauts Anne McClain and Christina Koch were set to make history Friday as the first all-female crew to conduct a spacewalk at the International Space Station. But Koch will instead be joined by male colleague Nick Hague due to spacesuit availability. The astronauts were set for a series of three spacewalks to complete work on the International Space Station. On March 22, Hague and McClain conducted the first in the series. McClain and Koch were set to go out together Friday to continue work on installing powerful lithium-ion batteries for one pair of the station’s solar arrays. “However, after consulting with McClain and Hague following the first spacewalk, mission managers decided to adjust the assignments, due in part to spacesuit availability on the station,” a NASA statement said. McClain was on the International Space Station as part of Expedition 58, while Koch blasted off into space on March 14 to reach the station for Expedition 59 and 60, along with Cmdr. Alexey Ovchinin and Hague. It’s the first time in space for McClain and the first spaceflight for Koch. 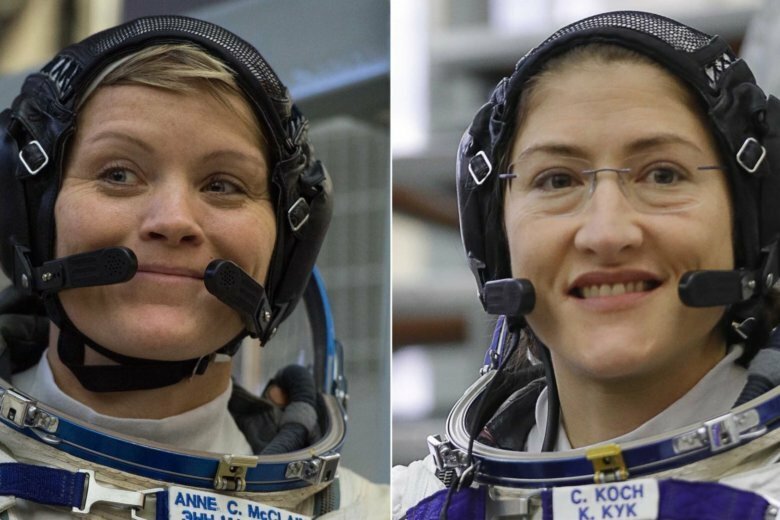 This article has been updated to clarify that the all-female spacewalk has been delayed for now.